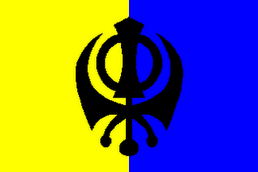 THE ROAD TO KHALISTAN: Hallowe'en and Sikhs - Again. Hallowe'en and Sikhs - Again. Last year I wrote about my dislike of Hallowe'en. That has not diminished over the last year. If you don't know about Hallowe'en, what it is, what it's all about I suggest you check out last year's blogpost about Hallowe'en.. Here is an excellent article about Sikhs and Hallowe'en by Harjinder Singh. Halloween is a global festival which is cheerfully celebrated with kids trick or treating, people mocking and gimmicking ghosts, ghouls, goblins and demons. For Sikhs on the other hand Halloween carries a real grave significance, of real ghouls and demons, who massacred Sikhs in October and November 1984. On Halloween, 31st October 1984, Indira Gandhi the Indian Prime Minister was assassinated. (Mai's note: executed) What followed her death was inhumane, depraved and despicable, some call it genocide others ethnic cleansing, I"ll let the readers decide what they feel. The world silently turned a blind eye to these events and rather mourned the death of Mrs Gandhi. Sikhs were burnt alive, raped, made refugees, murdered on mass, Gurdwaras attacked and Sikh businesses singled out for attacks. All this happened in what Sikhs at the time saw as "mother India." What was the crime of these Sikhs? What had they done to bring out the demons of Halloween? These words ring true of what happened to Sikhs across India following Mrs Gandhi's death, to the extent that Guru Sahibs words above aptly describe the attacks on these common, everyday Sikhs. 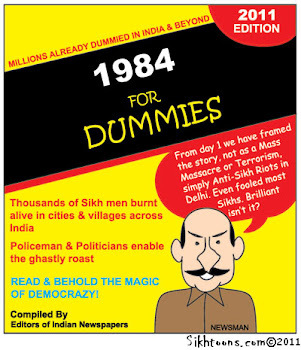 Sikhs were brutally and clinically attacked in cities across India, Delhi, Kanpur, Patna and the list goes on, over 10,000 Sikhs died between 31st October - 3rd November, 1984, many more refugees lived on with nightmares of what they witnessed.